An online e-Safety training course specifically written for parents and carers, designed to assist schools with engaging parents in their e-Safety training message. This course gives an introduction to topics including online risks to children, cyberbullying, sexting, inappropriate content and where to seek further help. An excellent, straightforward course, invaluable for all parents with young children who have access to the internet. I thought this was a very good course and it has made me think of the internet in a different light. I have learnt new things that I wasn't aware of before and some of the information does make you really think about how the internet is being used by others as well as our children and just how easy it is to gain access to our children when they are on the internet, so it is extremely important to keep them safe. A very useful and informative course. Is this e-Safety training course also suitable for schools staff? Staff working in schools or education should take our e-Safety Training online training course instead, which offers sector-specific scenarios and further information on reporting concerns and dealing with incidents. I work in England/Scotland/Wales/Northern Ireland. Is this e-Safety course suitable for me? The information provided in our e-Safety for Parents online training course is suitable for parents and carers in all areas of the United Kingdom. Does this e-Safety course include information on other aspects of child protection and safeguarding? Our e-Safety for Parents online training course provides an in-depth introduction to e-Safety training, but it does not include other aspects of safeguarding or child protection training. If you are interested in learning about other areas of child protection, we have a range of online safeguarding training courses available on our website. Upon successful completion of the course, you’ll be able to download a personalised training course certificate valid for 2 years. This course is designed to introduce you to the fundamentals of online safety. You will learn steps that you can take to protect your children, and where to go for help if you need it. There will also be information on what you should be reporting and to whom. The content intersects with the aims of several areas of legislation and guidance, such as The Children Act (1989), The Prevent Duty (2015), Working Together to Safeguard Children (2018) and other key statutory and non-statutory regulation and support. While there are varying definitions of what we mean by ‘online safety’ and although there are many benefits to the online society, areas such as gaming and social media can also have a level of danger that we need to be aware of. The internet is one of the most important advances in human history but it does not come in a ‘lite’ or ‘child-friendly’ version, so we need to empower our children to know the correct way to use it. By the end of this module, you will have looked at the meaning of online safety, the importance of raising awareness and the role that empowering your child to make good choices plays in increasing their safety. The internet predator is one of the most dangerous sources of potential physical and psychological harm to children, as well as one of the most prominent in the public eye. In this module, we will look at the methods used to groom children online, the techniques adopted by abusers, and the dangers children and young people could encounter online. With the rise of mobile devices and the ease with which images can be taken and shared, it is no surprise that there has been a sharp increase in the cases of illegal images of children being shared online. This module looks at this increase and puts the scale of this problem into perspective, providing advice and guidance on how to avoid the problem. Children can be cruel to each other, and learning to get along with others is part of growing up, but bullying is a problem that can create real issues for some young people. When this extends into the online world, it brings an additional dimension to the problem because children often feel there is no escape from the attacks. This module is an overview of what cyberbullying is and how it can be recognised. Sexting is a major problem and is frequently in the news. Essentially, it is the sharing of sexually explicit images or texts and it is on the rise among young people and a worryingly large number of children. While children may think of images sent through chat services as being temporary, the truth is that nothing is ever fully deleted on the internet. Even if all participants are under 18, it is still illegal to take and share these images. This module is an overview of the controversy surrounding the practice of sexting. Staying safe online also means protecting your identity from being used by criminal gangs. As a result of identity crime, you can find yourself the victim of a range of problems, from losing your credit rating through to major theft. In this module, we will look at some of the methods used to perpetrate identity crime online. As bizarre as it sounds, there are places on the internet that actually promote eating disorders and self-harm to young people. With the constant pressure to conform to what is perceived as the right image, children and young people are particularly vulnerable to these types of destructive behaviours. This module looks at the issues surrounding these sites. Social media and the video-based YouTube have become part of the social world of many children and almost all teenagers. Despite the age limit required to have accounts on them, many younger children now use social platforms to keep in touch with friends and talk to the world. What should be a very positive and worthwhile experience, though, can have a darker side, and social media is often linked to a range of online problems. This module considers social media in the context of young people and adults. Module 10 - What are the statistics? There seems to be a never-ending stream of statistics about the use and dangers of being online. This module will put the research and statistical analysis into easy-to-follow bites of information, to allow you to more clearly see what the numbers really mean. 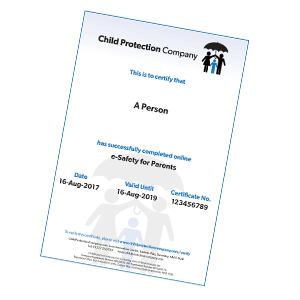 The final module in the course gathers the information and areas we have looked at together and looks at the methods you can adopt to increase the safety of your child online. While it is never possible to keep our children 100% safe, it is possible to decrease the likelihood of them falling prey to a potential danger online. This part of the training will assess how well you have understood the content of your course by asking a series of questions about what you have learned. Once you have passed your assessment, you will be able to download your certificate. Your pass rate will be 70%, but don’t worry if you do not pass the first time, as you can take the test multiple times. If you want to know more and continue to expand your understanding of online safety, this section contains additional reading and resources that you will find useful.